Your email will be added to the list for concert announcements. See you at the show! IAN MASKIN | Two shows! Breaking boundaries both musical and geographical, cellist, composer and multilingual vocalist Ian Maksin has created and developed his own unique genre by blending elements of different styles in a new way using his cello as the main unifying force. He sings in nearly 20 languages. 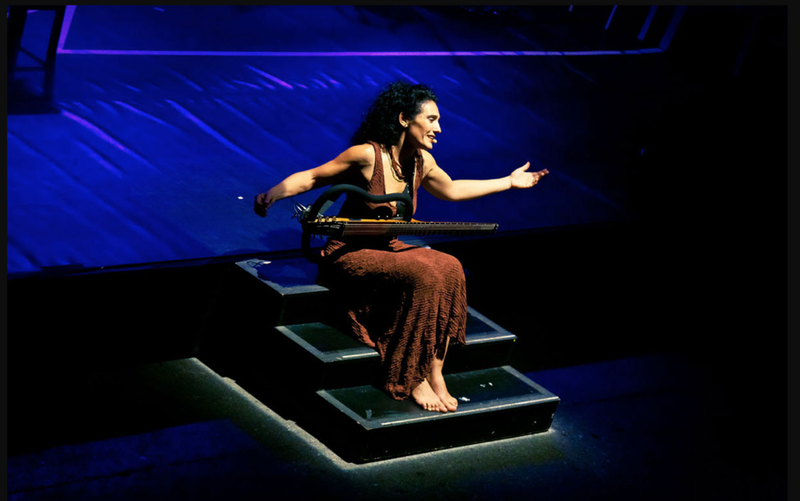 Apart from being highly regarded as a classical artist, Maksin collaborates with other artists in a variety of music genres: jazz, blues, flamenco, rock, R7B and world music, blending many styles together using cello as the common denominator. He can often be heard and seen in collaborative projects with artists from different corners of he globe including from Morocco, Cuba, Serbia, Iran, Pakistan, India, Spain, Mexico ,and Japan. Among the artists that he has performed and recorded with include Andrea Bocelli, P.Diddy, Snoop Dogg, Gloria Estefan and Barry Gib. He has opened performances for Sting and his guitarist Dominic Miller. Ian Maksin was born in St. Petersburg, Russia and started his cello studies at age six at the Special School for Gifted Children of the Rimsky-Korsakov Conservatory. At 17 he came to the United States to attend Manhattan School of Music later becoming the principal cellist of the New World Symphony under the direction of Michael Tilson Thomas. During that time his mentors included such artists as Lynn Harrell, Mstislav Rostropovich, Yo-Yo Ma, Bernard Greenhouse among others. Combining the worlds of Brazilian music and jazz in a chamber music type setting, these three instrumentalists have produced a body of work that blends the swinging exuberance, virtuosity, and charm of the many different rhythms of Brazil along with that country's characteristic tender lyricism; mix all this with the spontaneous discoveries of Jazz improvisation and you have a unique trio! Freire and Godoy, two major figures of Brazilian instrumental music, are on a brief US tour with Wainapel to release their new CD "Novos Caminhos"
Brazilian jazz duo Ricardo Peixoto and Marco Silva have collaborated with other world class musicians who are household names in the Brazilian jazz scene. Ricardo has collaborated with Flora Purim and Airto, Dom Um Romão, Sivuca, Claudio Roditi, Toots Thielemans, Dori Caymmi, Guinga, Arturo Sandoval and Spok. He has performed throughout the US, Europe, Canada, Japan and Brazil. Marco Silva was musical director for Flora Purim and Airto Moreira for 24 years. Marcos has written arrangements for Dizzy Gillespie’s band and replaced Gil Evans as arranger-composer of Airto’s Spiritual Mass in Germany. Sabir is a virtuoso in musical improvisations with sustaining melodic and rhythmic skills framed by the raga form and interpreted in vibrant play by which he renders the “hundred colours” of the sarangi, the sublime and most demanding of instruments. Sabir has opened an exciting new phase for North Indian music and the Rajasthani folk compositions that he inherited from his forefathers. Simone Norblom is a Kundalini Yoga teacher with more than 20 years of studying Kundalini as taught by Yogi Bhajan, Simone has been a student of many radiant teachers including Guru Singh, Shiva Rea, Seane Corn, and Maty Ezraty. Visiting from Rio de Janeiro, Almir Côrtes presents the North American premier of his CD “Trançado.” Recorded in Brazil and California, the album’s title roughly translates to “braided” or “interwoven,” reflecting the repertoire’s mix of Brazilian folkloric rhythms with jazz improvisation, as well as the cultural interchange between Brazil and the USA. The project was awarded a generous grant from the state of São Paulo, funding the recording as well as a tour throughout that state. Internationally recognized Czech pianist Karolina Syrovatkova has been called by the ABQ Review "a true poet of the piano." She is known for her innovative approach to performing in which she combines her pianistic and dramatic talents to create shows about great composers. Karolina performed a Clara Schumann program that she performed earlier in the year at the Kennedy Center in Washington, DC. Grand National Fiddle Champion Tashina Clarridge has toured with Mark O’Connor, Tony Trischka and Laurie Lewis and performed at Carnegie Hall as a part of MacArthur Fellow/Grammy-winning bassist Edgar Meyer’s Young Artists program. Multi-instrumentalist brother Tristan Clarridge is a 5-time Grand National Fiddle Champion and a pioneering cellist, synthesizing traditional folk influences with rhythmic vocabulary from jazz, rock and pop music, and leading a revolution among adventurous young cellists throughout the country. Hammer dulcimer wizard and composer Simon Chrisman brings a whole new approach to an instrument that has previously been thought to have limited range and technique. World renowned Brazilian singer, songwriter, percussionist, and guitarist in the jazz and worldbeat genres. Brazil's Badi Assad is one of the most innovative, passionate and talented Artists of all times and is lauded as one of the world's most unique and cross-transcendental performance artists of this generation. She transcends traditional styles of her native Brazilian music with a mixture of pop, jazz and world/ethnic. Badi played on the Inverness Ridge the night before she played Herbst Theater in San Francisco. A recent documentary film about Badi’s life called BADI won Best Documentary at the LA Brazilian Film Festival. São Paulo pianist/composer/arranger AMILTON GODOY is a true pioneer of modern Brazilian instrumental music. In 1964 he founded the iconic Zimbo Trio. This became one of the most influential Brazilian instrumental groups in the second half of the 20th Century, making 51 recordings and playing in 40 countries over the years. LÉA FREIRE is a major force in creative Brazilian music, as a performer, composer, and producer. HARVEY WAINAPEL, They were joined by Bay Area saxophonist/clarinetist HARVEY WAINAPEL, who has toured internationally with Airto Moreira & Flora Purim, Joe Lovano, Ray Charles, and Jovino Santos Neto. Steinway artist and filmmaker Antonio Iturrioz presented his "Gottschalk and Cuba" program from his upcoming CD which he recorded at Skywalker Ranch. He played a world premier of his arrangement of a piece written for a 650 piece orchestra for a single piano. Grammy artist and founder of platinum selling bluegrass trio Nickel Creek played his new material from his newly released album, What to Fear. What To Fear is a follow-up to 2014’s acclaimed All I Do Is Lie, which had been Watkins’ first solo effort in nearly a decade, ten years that had been jammed with collaborative projects and a herculean amount of touring. On his own, Watkins displays tremendous warmth and soulfulness as a singer, a refreshing candor and humor as a lyricist, and prodigious skill as an arranger. In the tradition of songwriters like Townes Van Zandt, Leonard Cohen, and Jay Farrar, Jacob's music is intensely beautiful, well-crafted, and haunting. His alternative folk songs weave flawlessly between light and dark, with a lyricism that conjures forth cinematic images of landscapes both external and internal. Her recently released EP The Long Embrace was recorded and produced by Ben Tanner, member of the Grammy-award winning band Alabama Shakes. Featuring musicians Caleb Elliott, Jeremy Gibson, Adam Morrow (Belle Adair), and Ben Tanner, The Long Embrace was recorded in John Paul White's (Civil Wars) Sun Drop Sound Studio in Florence, Alabama and pulsates with ethereal longing and a driving rhythm inspired by the Muscle Shoals sound.